Fiesta de Nuestra Señora de Guadalupe | ¡VidaMaz! 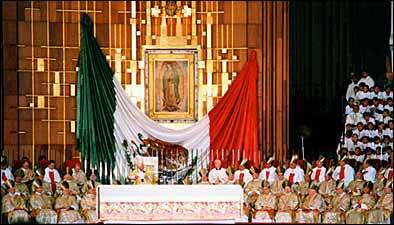 Our Lady of Guadalupe is the patron saint of the Americas, and she is often referred to as the Queen of Mexico. Her image appeared both on the flags of the Mexican War of Independence and of the Revolutionary War. 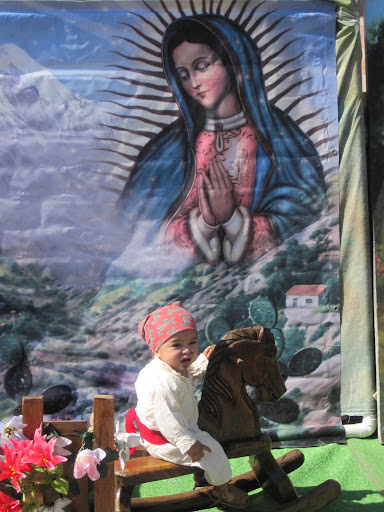 Most Mexicans pray to the Virgin of Guadalupe for their most intimate and heartfelt desires, as do many people throughout Latin America. She is seen as an indigenous saint, the saint of the Indians and the poor, someone to whom the humble may turn to ask for help. She is a symbol of pride and comfort to indigenous people of Latin America. In Flagstaff Arizona, where I grew up, we have a parish church named La Virgen de Guadalupe. My father dearly loved the Virgin, and his funeral mass was held in that beautiful small church, with the parish priest wearing robes with the Virgin’s image. She is near and dear to my heart. 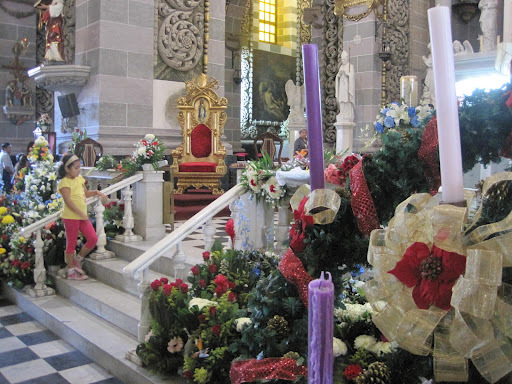 Guadalupe Day is today, December 12th. This year it falls on a Saturday, so the Virgin’s feast is even more festive than usual. 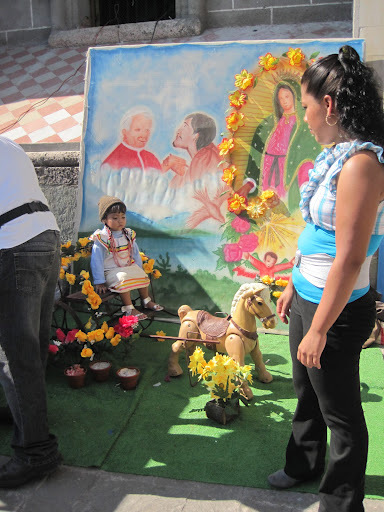 Every woman named Guadalupe also celebrates her saint’s day today, which in Mexico is celebrated much like a birthday. 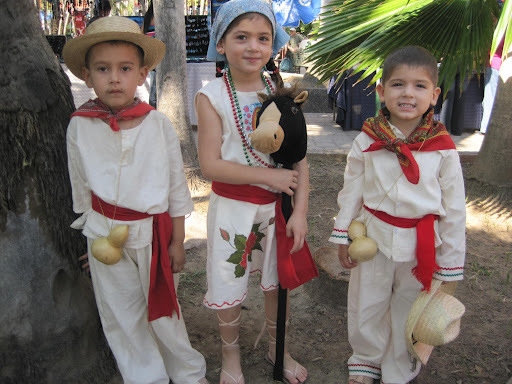 Each year on the eve of Guadalupe Day there are processions all over town. 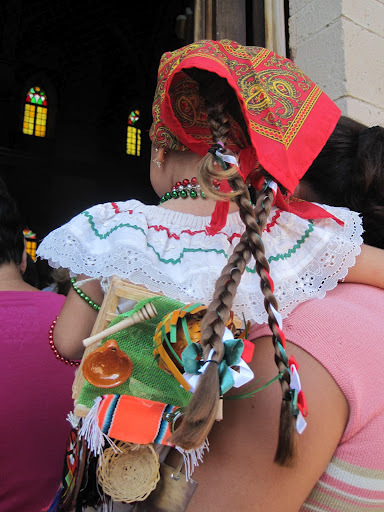 People parade her image through the streets to various churches. There is usually a midnight mass. 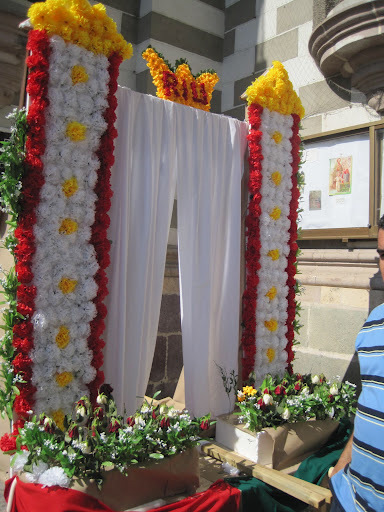 A picture of one of the floats that is carried, holding the Virgin’s image, is below. 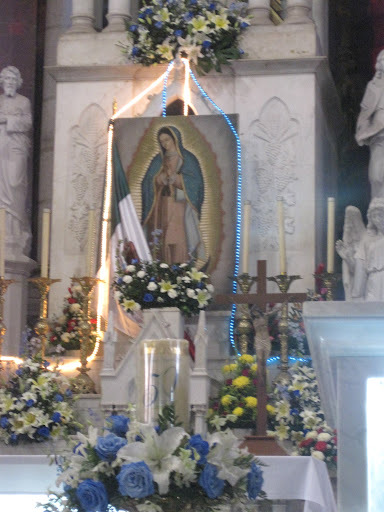 Then, on Guadalupe Day itself, there are masses nearly every hour on the hour from early morning. 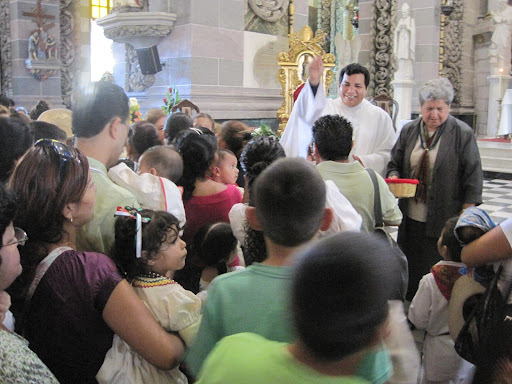 Parents bring their young children in to be blessed by the Virgin, and by the parish priest. 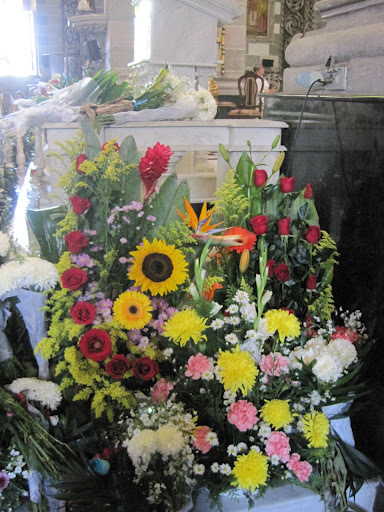 The church is filled with gorgeous and fragrant flowers, people, and activity from the evening before Guadalupe Day to late that night. 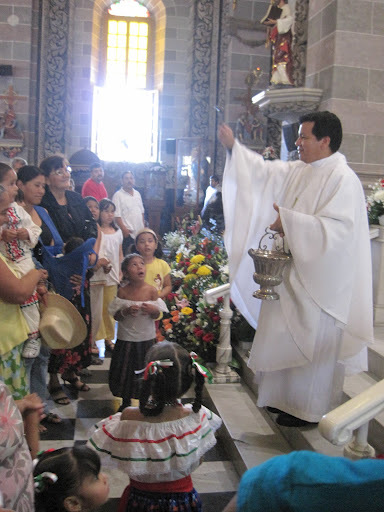 Masses are said, the Virgin’s image is front and center on the altar, and the priest blesses the children with holy water. 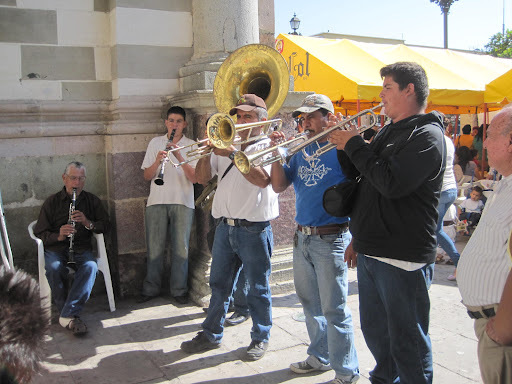 All around the church and filling the plazas in front of the churches are food stands and stalls with toys and holy images, as well as numerous bands playing, creating a very festive atmosphere. It’s a great day for photographers, as many of them set up studios around the cathedral with images of the Virgin and props such as donkey-drawn carts. Parents and grandparents pay them to take photographs of their costumed children on this important day. 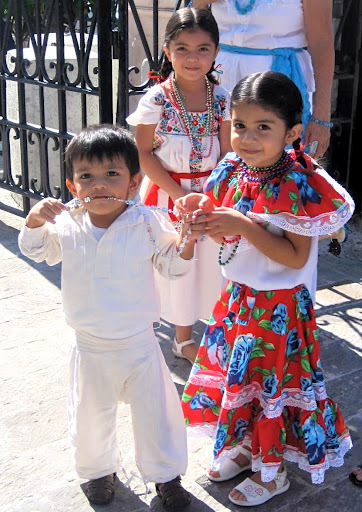 Saturday December 9, 1531, 10 years after the fall of the Aztec empire to Spanish forces, a young girl of about 15 years of age appeared to a 57 year old Indian man (Juan Diego, born Cuauhtlatoatzin) while he was walking in the mountains just north of Mexico City. He frequently walked three and a half hours to church in bare feet, and was doing so when he saw the girl. By the words she used and the message she conveyed, Juan Diego knew her to be the Blessed Virgin Mary. The Virgin addressed Juan Diego in his native Nahuatl language, and asked him to speak to the local Catholic bishop, so that a church in her honor might be built on the site where they’d met (Tepeyacac, Capilla del Cerrito). The bishop, a Franciscan Spaniard named Fr. Juan Zumarraga, is said to have received and listened to Juan Diego’s story, but did not believe him. Juan Diego returned to Tepeyacac, apologized to the Virgin, explained he had done what she requested, and asked that she please enlist the assistance of someone with more stature than he to talk to the bishop. The girl told Juan Diego to return to the bishop the next day, which he did. 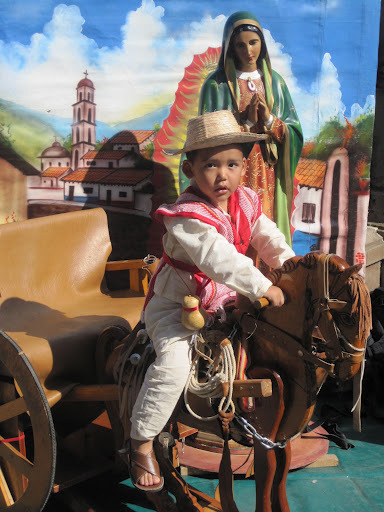 The following day, after Sunday Mass, Juan Diego again secured an audience with the bishop. 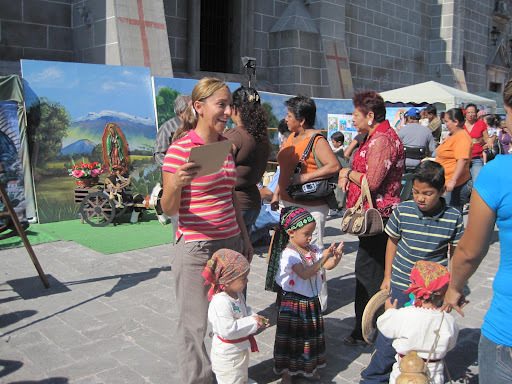 The bishop asked him to explain his story in more detail this time, and sent Juan Diego away telling him to bring him a sign to prove his story. Juan Diego walked home and met the Virgin on the way, telling her this latest news. She asked him to return to her in the morning, and she would give him the sign. 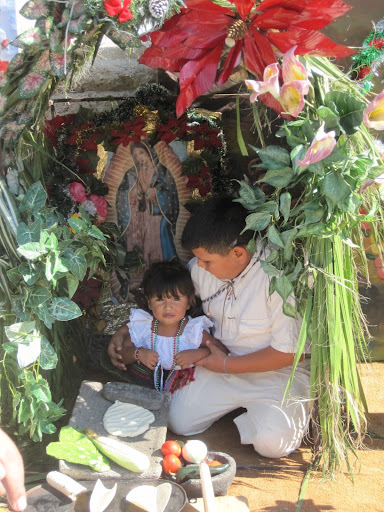 On Monday Juan Diego did not return to visit the Virgin, because his uncle, Juan Bernardino, had fallen gravely ill. On Tuesday morning before dawn Juan Diego set out walking to town to call the priest, to provide the last rites to his uncle. He did his best to avoid the site where he saw the Virgin, so as not to be delayed in his quest to get the priest quickly for his uncle. Nonetheless, the Virgin saw him. She assured him that his uncle would be cured of the disease and would not die from it. She told Juan Diego to climb to the top of the hill where they had met, and to cut the unusual flowers that he would find there. Juan Diego did, gathering in his cape (tilma) many different types of beautiful and fragrant Rosas de Castilla from the bishop’s native Spain, in full bloom during a time of freezing weather. When Juan Diego finally was able to appear before the bishop, he opened his tilma to show the bishop the flowers, and there on the fabric to everyone’s surprise was also imprinted the image of the Virgin! 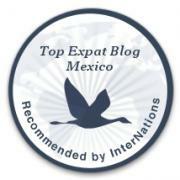 The bishop this time agreed to build a temple in the Virgin’s honor at the site where she appeared in Tepeyacac. The following day, Tuesday December 12, the bishop and his staff accompanied Juan Diego to the site of the apparition, so that they could know where to build the temple. Once they arrived, Juan Diego asked to be excused in order to visit his uncle who had been ailing, and make sure his Uncle Bernardino was healthy. The bishop and his entourage made the journey with Juan Diego. When they arrived at the home of Juan Bernardino, they found him to be healthy and happy. He reported to the group that he had been cured when the Virgin visited him, and that she had told him her name was the Holy Mary of Guadalupe. Nearly 500 years after the Virgin’s appearance, Juan Diego’s cactus-cloth tilma shows no signs of decay, and the image of the Virgin remains. 25 Popes have honored her, and in 1999 Pope John Paul II declared December 12 a liturgical holy day for the continents of the Americas. 18-20 million people per year make the pilgrimage to her basilica.